Whew! Two sermons in one week! Christmas is definitely a working holiday for me. The text is Matthew 2:13-23. One of the singular (and often dreaded) features of the Christmas season is the plentitude of family reunions that take place. The kids in every family prepare to have their hair tousled, their cheeks pinched, and great aunt so-and-so’s lipstick smudged on their foreheads. For some strange reason, grown-ups have an irresistible urge to identify themselves (or their relatives) in the kids around them. “Look at him,” they say, “Ain’t he a chip off the old block?” Or “Oh my goodness, she’s just like her mother used to be!” (To those of you who are kids: I would like to apologize on behalf of grown-ups everywhere. We know it’s annoying. We don’t know why we do it. We just do it.) There’s something inside of us that wants to connect the dots between the present and the past. In the part of the story we read today, an evil king is killing all the baby boys in the land and one family has to do some very sneaky things in order to save the life of one very special baby. Can you think of another time in the Bible when something like this was happening? If you guessed ‘Moses’, you’re right! In the book of Exodus, the Pharaoh of Egypt is scared that his Hebrew slaves are getting too difficult to control. He feels like his power is being threatened by them. So, he institutes a program of genocide, ordering that all the baby boys born to the Hebrew slaves should be killed. But baby Moses’ family hides him in a basket of reeds in order to protect him. In today’s reading from Matthew’s gospel, King Herod, another evil king, is scared because he has heard that a new ‘King of the Jews’ has been born in Bethlehem. Herod liked his crown right where it was, so, in an effort to protect his power, he orders that all the baby boys in Bethlehem should be killed. But baby Jesus’ family sneaks him out of town in the middle of the night in order to protect him. Don’t these two stories sound similar? The author of Matthew’s gospel did that on purpose. You and I are supposed to notice that the story of Jesus sounds a lot like the story of Moses. Why is that important? Well, first of all, it’s important to remember that Jesus and most of his early followers were Jewish. 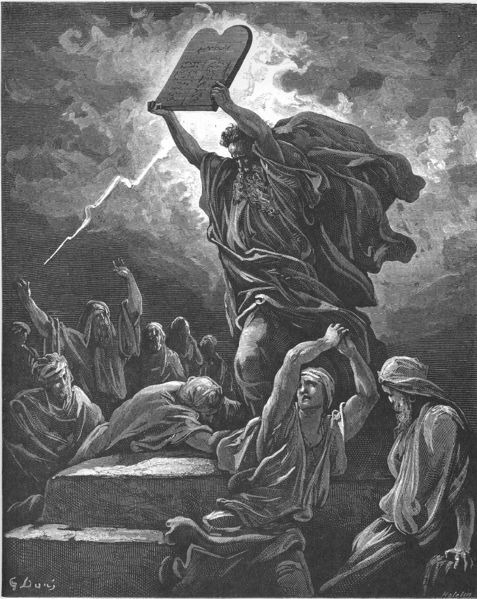 Moses is a very important person to Jews. He liberated their people from slavery and genocide in Egypt. In the same way, the early Jewish Christians believed that Jesus had liberated them from slavery as well. But this time, the threat wasn’t coming from some foreign Egyptian king. This time, the threat was coming from within their own people. Their own kings, like Herod, were starting to act as evil and nasty as old Pharaoh once did in Egypt. Their culture was rotting from the inside out. Even their spiritual and religious leaders couldn’t be trusted! It was time for another Exodus! The author of Matthew’s gospel intentionally portrays Jesus as the ‘New Moses’ because Jesus is the one who would liberate the people from slavery in their own homeland. There’s another reason why the author of Matthew’s gospel compares Jesus to Moses. As the New Moses, Jesus stands in continuity with his Jewish heritage. This would have been very comforting to the early Jewish Christians. It meant that Jesus honored the very best part of their tradition, even as he took it in a new direction. Jesus challenged their ideas about inclusivity. Traditional Jews thought of themselves as God’s unique and chosen people. They alone, of all the nations of the earth, had received the Torah of Moses and the prophets. But then Jesus comes along and says of a Roman Centurion (a pagan), “This Roman has more faith than any Jew I’ve ever met!” The early Jewish Christians wrestled with statements like that. Eventually, it led them to the conclusion that God was now accepting people of all races and nationalities as “chosen”, not just Jewish people. They opened the doors of the Church to include the whole world in God’s embrace. To traditional thinkers, that would have sounded like heresy. Likewise, Jesus also challenged traditional ideas about sin. For example, work was forbidden on the Sabbath day (including healing), but Jesus would heal people whenever he had the opportunity (even on the Sabbath). Wasn’t that a sin? Didn’t it go against the commandment to “Remember the Sabbath Day and keep it holy”? Was Jesus asking them to sin against God?! Jesus responded to questions like that by saying things like, “The Sabbath was made for people, not people for the Sabbath.” Statements like this made Jesus’ Jewish followers very uncomfortable. It helped them to know that Jesus honored the very best parts of their tradition, even as he challenged other parts and led their people in a new direction. Today, I am introducing you to this idea of Jesus as the New Moses. We’re going to come back to it a lot during the coming year as we read from Matthew’s gospel. We’ll see again and again how Jesus is leading people out of an old (but familiar) slavery and into a new (yet challenging) Promised Land. At the same time, he honors and stands in continuity with the very best their tradition has to offer. Those of us who are part of the Church today are no different from those early followers of Jesus. Like them, we wrestle with questions about inclusivity and traditional ideas about sin. Who is “in” and who is “out” when it comes to church life and ministry? Who is God calling us to embrace as our fellow brothers and sisters in Christ? How can we be faithful Christians in this time and place? How might faithfulness to God look different for us than it did for our ancestors in the faith? All of these are questions of tradition and innovation. Unfortunately, there are no easy answers to these questions. Some say we should dig our heels in and defend traditional ideas and practices. Others call for us to throw all traditional worship and doctrine to the wind in favor of innovation. Somehow, I think both of these simplistic answers are deficient. When I read Matthew’s gospel, I see Jesus honoring tradition, even as he challenges it. As we face these questions together, let us remember that we are not the first ones to do so. Christians in every age have had to wrestle with their own questions. While it may seem sometimes like we are just wandering back and forth through a barren desert, we are ultimately following Jesus, our New Moses, who has promised to never abandon us, and he can be trusted to faithfully deliver us to the place where we are supposed to be.